Soft Pastel 11" x 9"
Mill Lake, a pond in the center of the City of Abbotsford is home to a very large population of Canada Geese. 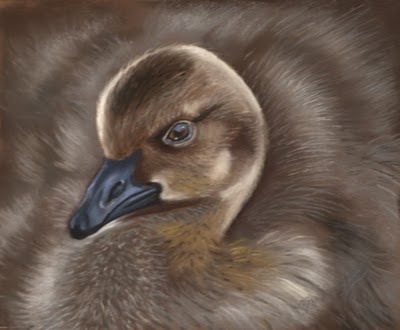 This little fellow is painted from one of the hundreds of images I have taken of the geese and their goslings. I'm looking forward to spring and capturing more images of these adorable babies. Although they are named after Canada as well as inhabiting most of Canada, they are also found in Alaska, and the northern United States, sometimes they also go as far as Greenland. Next to humans they are the most talkative creature, with the babies talking to their parents while still in the shell. They are family orientated and mate for life, although if one mate dies the other will re-mate. Both parents take an active role in parenting.